Heat oven to 375ºF. In medium bowl, stir cookie mix, butter and egg until dough forms. On ungreased cookie sheets, drop dough by rounded tablespoonfuls 2 inches apart. Bake 11 to 14 minutes or until edges are light golden brown. Cool 1 minute; remove from cookie sheets to cooling racks. cool completely, about 15 minutes. Stir frosting and 2 to 3 drops food colour until well blended. Frost and decorate 1 cookie at a time. 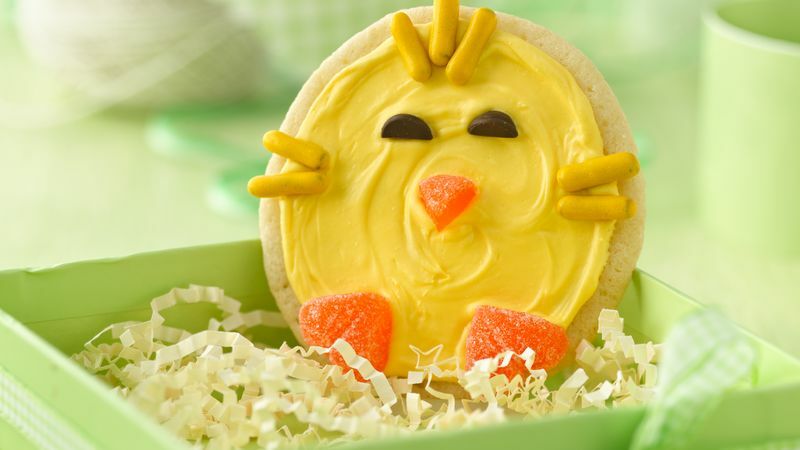 After spreading frosting on cookie, add chocolate chip halves for eyes, yellow candy-coated licorice for feathers and pieces of orange candy slices for beak and feet. Purchasing : Look for gel or paste food colouring in baking supply stores and larger grocery stores. Regular liquid food colours will thin the frosting too much.